Panzers, riflenades, shotguns and headshots. Just some ingredients for a nice map-cocktail. We promise you a "blast" of an evening. And you also need to keep your "head" clear. Come and show us your skills with all weapons available. 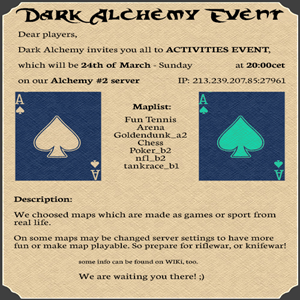 Hello dear community - here want to we announce that we want to start at the weekend a small cup (event) the 26.05.2012.To 17 clock. Here it comes one to find ball to move him in the tar of opponent in the middle of the map. Where to keep in mind is that you in the time where her the ball have not defecating can because her the ball otherwise away throws. Hallo liebe Community - Hier mit möchten wir bekannt geben das wir einen kleinen Cup (Event) am wochenende dem 26.05.2012 starten wollen. Um 17 uhr. Hier geht es darum einen Ball in der Mitte der Map zu finden um ihn dann in das Tar des gegner zu befördern. Wobei zu beachten ist das ihr in der Zeit wo ihr den Ball habt nicht schissen könnt, da ihr den Ball sonst weg schmeisst. After last month we noticed that the players on our Server A1 are in better shape. Therefor we continue our sports event. This month we have set up some activities to play - For example: Tennis, Golden Dunk, Chess, Poker. Nachdem wir im letzten Monat bemerkt haben, dass die Spieler auf unserem Server A1 besser in Form sind, setzen wir unsere sportliches Event (auf dem A2) fort. Diesen Monat haben wir auf folgende Aktivitäten gesetzt - zum Beispiel: Tennis, Golden Dunk, Chess, Poker. For those unfamiliar with the name: ClanBase once was a cool site to visit if you were an online gamer. With cups and ladders hosted for games such as the RtCW, ET, Quake, Unreal Tournament, Counter-Strike and Call of Duty series, a teenager really had quite some options for multiplayer entertainment. Heck, we even had LAN finals for our renowned EuroCups. Those days are far behind us and as it stands today, the company that owns the ClanBase site - GGL - is unable to cover the costs required to run the website. Moreover, lately the owners of the site do not wish to cooperate with the voluntary crew, keeping everybody in the dark and thus showing complete disrespect to people who spend many hours a day trying to make our tournaments a success. The website has now been offline for more than three weeks due to an unpaid bill. No action is being taken by the owner to get the website back online. Having no vision for the future, we - the ClanBase Crew - have lost our last hopes about ClanBase ever coming back online, and unfortunately we announce the end of a great era. A US-based company called Global Gaming League (Professional Interactive Entertainment, Inc.) noticed the success of the site and bought it from the original owners in December of 2004. They had financial backing for server hosting and our tournaments. Things were going well until in 2007 CB suffered its first heart attack when GGL couldn’t deliver the prize money they put up for the EuroCup. This can be marked as the start of our downfall. The CB Crew has always been made up of volunteers with the majority being just teenagers. There was no possibility for us to come up with the money on our own that was promised, yet we were always the ones getting blamed. After all, it was our cup season and our name. It is no surprise that after this blow there was no way for us to host another season with the promise of any kind of prize until the debt was settled with the previous winners. To this day, GGL owes around €24,000 in prize money which will never be settled. The other sites who were in the same gaming business of course had no problems hosting their tournaments however they wanted. ClanBase, however, lost a great deal of its reputation along with some top teams who never got their winnings. As time went by the site also started to decay. After the takeover we had paid developers who tried to put the code in shape. There were some noteworthy developments such as the seasonal and invitational ladders, but after the first test run we couldn’t get the necessary changes implemented - because GGL stopped paying the developers. Money. The source of all evil. GGL started moving the servers between hosts (RackSpace, Amazon, GreenQloud) to save costs, and to avoid further missed payments. This appeared in the news a few times when providers came out with how they were lied to. We also lost the ability to upload files anything other than demos. Fortunately, a Crew member had the means to help out. Funding continued to dry up. After the first wave of cuts where we lost the two developers and a head admin, things cooled down for a while. Recently, a general system administrator was cut off which got interesting at one point when CB suffered a denial of service attack to which the host (GreenQloud) responded with moving the servers to a different IP address. However, the domain name had to be updated as well to point to the new address. Since our sysadmin was not getting paid, he refused to perform this, essentially holding the site hostage for a while. So how do we get money? The site had ads for a while which obviously was not enough. We may have been naive thinking that upping the quality of the site would be a good move, which was promised more times we bother to count. GGL thought otherwise. In fact, many of the cool features our gamers would have loved to see on the website were never implemented - because "CBv2” was supposedly just around the corner. Their first bold move was trying to get adult banners on CB - a website that was home for thousands of teenagers. The Crew was shocked and appalled by this. Fortunately, we managed to get our voice through (by threatening to go on strike) - but we also lost several valuable crew members who had enough of the poor conditions and bad decisionmaking. Next to adult material, gambling can also be a good source of income. The Poker and Betting ladders were introduced. It is doubtful that much money was ever made of this, at least nobody said otherwise. The only thing certain is that these projects never got off the ground. A poor attempt was also made to gather money in the form of offering VIP membership. Nobody took this very seriously and as expected, nobody bothered to opt in after a while. The only benefit to having VIP was the ability to get rid of some of the ads. Perhaps a regular donation system would’ve been more useful. By the end of August 2013, yet another problem surfaced: the money ran out for the hosting. This is when CB started to go down every month when the time came to pay for the next 30 days. Of course we tried contacting GGL through our manager who was in charge of handling communications. As you may have guessed by now, he also failed to receive his payment for a while and a company owing money to you, and who knows how many others, is not in a hurry to get back to you. The ClanBase management tried to directly contact the GGL founder and president Ted Owen (since everyone else left), with very little success. Whenever we got a response it usually consisted of no more than a few words. Mr. Owen, the Crew put time in it. A lot of time... for free. Every day. And to clarify, nobody has ever reached out to us to ask for any kind of financial aid. Not that we would’ve ever agreed to anything if the money had to go through GGL as that would’ve resulted in the money never reaching its intended destination. Ultimately, we understand that our users would have expected us to come out with the truth sooner. It has taken us three weeks to make a public statement - but the only reason it took so long is that we were trying to not lose the hope and to reach out to mr. Owen. Unfortunately, our last request (or offer) to him - to release the ClanBase site to the crew for us to be able to continue running it on our own, without the GGL - was not welcomed. It is thus our sad duty to inform you that ClanBase is gone. We would like to sincerely thank over a thousand admins working on the website over the past 15 years of ClanBase’s existence. And an even bigger thanks goes out to all the players who supported us over the years and who did not lose faith no matter what. This writing has not come easily because ClanBase has been a big part of our lives, and we definitely did not want to see it end like this. Die Clanbase war einmal eine sehr coole Website für Online- Gamer, mit Cups und Ligen für Spiele wie RtCW, ET, Quake, Unreal Tournament, Counter-Strike und der Call of Duty-Serie. Diese glorreichen Tage sind nun hinter uns, und heute steht es um die Clanbase Website sehr schlecht - wir sind nicht mehr in der Lage, die erforderlichen kosten der Website zu decken. Die Website war offline für mehr als drei Wochen, wegen einer unbezahlten Rechnung. Keine Aktion wird vom Eigentümer übernommen, um die Website wieder online zu bekommen. Da sie keine Vision für die Zukunft mehr hat. Wir - die Clanbase Crew - haben unsere letzten Hoffnungen die Clanbase jemals wieder online kommen jetzt endgültig verloren, und müssen leider das Ende einer großen Clanbase-Ära verkünden. Die Prognosen standen auf Sieg für das ehemalige Team idle, jetzt bekannt als Team Dignitas. Die Prognosen trafen ein, ein weiterer Sieg in Folge, zeroPoint! war ohne butchji nicht einmal im Stande den Sieg zu schnuppern, leider. Es hat für sie nur für den zweiten Platz, nach der 0:4 Niederlage, gereicht. Bei der shgOpen Lan in Dänemark wird die Revange auf einer LAN folgen, doch wieder ohne Butchji. Wir gratulieren allen Clans, die es auf das Siegertreppchen geschafft haben. Welcome everyone to the first Prime-Squadron organised ETpro League . * All matches are played on ETPro Stopwatch 3on3 mode with the global 3on3 config. * When sign-ups are completed, the teams will be seperated randomly into 2 groups. Aiming for 2 groups of 4 teams. * From both groups, 2 teams will continue into a Single Elimination bracket to eventually come up with the Prime-Squadron ETpro League winners. * Each match will be played over atleast 2 maps. Both teams will chose a Map on which they will first try to set a time following by the opponent trying to beat that time. * In case of a draw, a third match will be played. A cointoss will determine which team can chose the last map. This last map has to be chosen from the remaining mappool. The team who lost the cointoss will chose who has to attack first. * Not all matches have to be played in 1 day. In case of enough teams or too little time, the tourament can be spread out over 2 or 3 weeks. * After a win, the winning team will get 2 points and the losing team gets 0 points. * Client net settings: snaps 20, maxpackets 100, timenudge 0. * Every game must be recorded by atleast 1 player of either team. These demo's have to be available in case of a disagreement on the scores. If no demo can be shown, it will result in a Forfeit. * Make sure you have all the correct maps downloaded before the ETpro League starts. 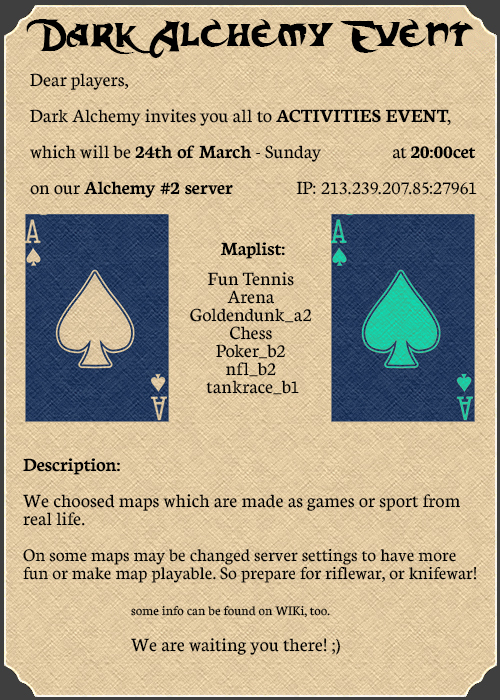 We cordially invite all players to participate in the tournament. The exact method of elimination will be announced when the entries are completed. To sign up for the tournament enter your nickname from the game on this post. Entries will last until Friday, October 17, 2014 y. The fun will begin on Saturday, October 18, 2014 y. 23:00. The tournament will not take place if you do not report at least 8 volunteers. Serdecznie zapraszamy wszystkich graczy do wzięcia udziału w turnieju. w pojedynkach jeden na jednego. Dokładny sposób eliminacji ogłosimy gdy zakończą się zapisy. Żeby zapisać się do turnieju wpisz swój nick z gry pod tym postem. Zapisy potrwają do piątku 17. października 2014 r.
Zabawę rozpoczniemy w sobotę 18. października 2014 r. o godzinie 23:00. Turniej nie odbędzie się, jeśli nie zgłosi się co najmniej 8 chętnych. Team Muppet Vietnam BoozeNight - We would like to invite you for its Booze event on the 15th of September, starting at 19:00 GMT+0 till you're to wasted to continue. Bring your alcoholic beverages and your best aim to enjoy an unforgettable night. And feel free to join us at our teamspeak3 server during the event for the extra experience!! For further questions/information visit our website and join us in the chat.We are looking forward to see you there.